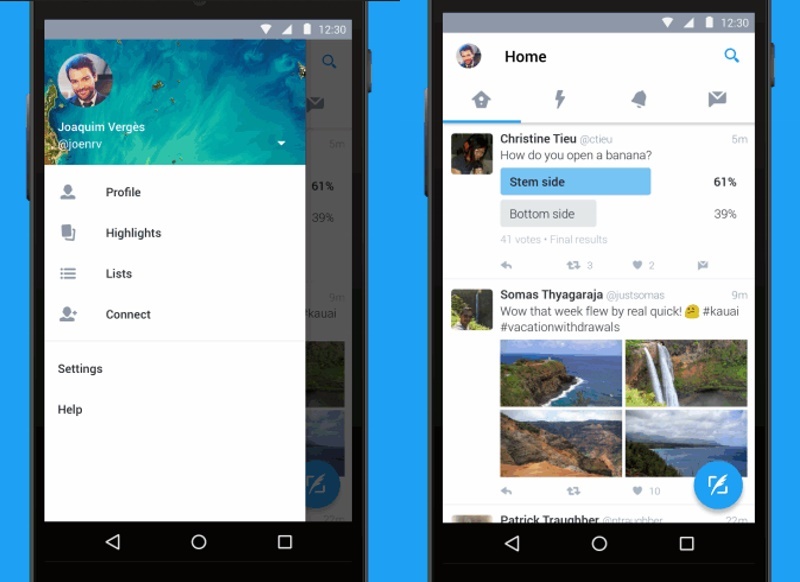 Micro-blogging website Twitter is rolling out a redesigned Android app based on Google’s Material Design philosophy. The Material Design makes use of grid-based layouts, responsive animations and transitions, padding, and depth effects such as lighting and shadows. The app is now split into four tabs – Home, Moments, Notifications, and Messages – that you can move between by tapping the icons at the top of the screen, or using a horizontal swipe. There’s also a floating action bar to compose new tweets. Dragging across from the left-hand edge will reveal a side menu with shortcuts to your profile, lists and Twitter highlights. The drop-down arrow at the top of the menu will let you switch accounts. Twitter said the new design is rolling out to everyone on Android on Wednesday and will be available after an app update. “Today, we’re introducing a new look and feel for Twitter for Android – a redesigned app that aligns with the best of Android,” said Maryann Vellanikaran, Engineering Manager, Twitter for Android, in a blog post on Tuesday. Twitter is reportedly all set to change its consumer product boss Jeff Seibert, who took over company’s core product team last September. Seibert, who co-founded crash reporting solution Crashlytics, will go back to running Twitter’s developer product suite Fabric, which he was doing before the promotion in the fall, a media report said. Twitter still does not have a permanent replacement for Seibert and is planning to give Ed Ho, a senior engineering director, who has been at Twitter for two years, the responsibility to fill the role on an interim basis, the report added.